CarPlay is Apple's answer to the car infotainment system. Run by your iPhone, CarPlay replaces the navigation, media, phone and messaging controls of your car with those of iOS — and even includes Siri. CarPlay also works with the touchscreen, buttons, knobs and dials of your car, making navigation as intuitive as it is on both your iPhone and you car's own system. For Android users, Android Auto works in a very similar way, and is often included as an option on head units with CarPlay installed. When will my smartphone get the Android 9 Pie update? A recently-added bonus for both systems is wireless connectivity. Until recently, CarPlay and Android Auto would only work if you plugged your phone into the car with a USB cable. But now, with a wireless connection to the car (or the third-party head units listed below) you can leave your phone in your pocket or the glove box, and use CarPlay or Android Auto just as before, freeing up the car's USB socket for powering something else. But while CarPlay and Android Auto are mostly advertised as options on new cars, there are multiple ways to bring them to your older vehicle, thanks to after-market stereos. The head units featured in this article include all of the regular in-car entertainment features, like Bluetooth and DAB radio. But hey also bring CarPlay and Android Auto into the mix - and in some cases, wirelessly too. Here is everything you need to know about adding CarPlay and Android Auto (in some cases wirelessly) to your car, and some of the best options available to buy right now. DIN stands for the German phrase Dietch Industri Normen, and refers to a standard size of stereo the country's car makers began installing in the 1980s. DIN refers to a stereo — also known as a head unit — measuring two inches by eight inches. This is the size of a single DIN unit, while a double DIN is the same width, but is four inches deep instead of two. Obviously, such simplicity harks back to a time when car interiors and dashboards were simpler and more slab-sided than they are today. This design may not win many design awards. But it means older vehicles with poor stereos can be upgraded to the latest Silicon Valley has to offer. Apple CarPlay systems — which in most cases come with Android Auto too — tend to be double-DIM sized. However some single-DIN systems exist where the display slides out of where a CD slot would be and flips upwards. A quick warning: Car head unit makers are really terrible at naming their products, so you'll have to forgive us for repeating their meaningless, alphabet soup-inspired titles. The AVH-W4400NEX is a flagship double-DIN head unit from Pioneer. It features both Apple CarPlay and Android Auto an, crucially, can offer both with a wireless connection to your smartphone. This means there is no need to plug in with a USB cable, so your phone can stay in your pocket, in the glovebox, or rest on a wireless charger if your vehicle has one. You can opt to plug in your phone, if you so wish. 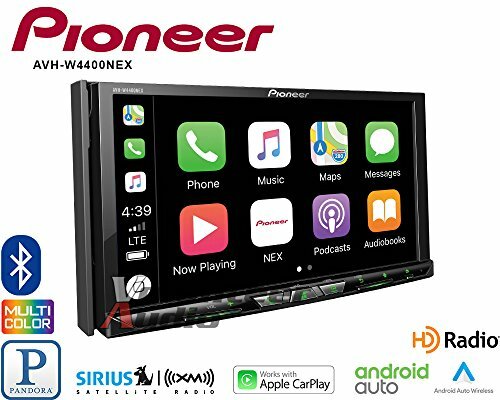 The Pioneer has a 7-inch touchscreen display, plus Wi-Fi, Bluetooth HD radio and a 13-band graphic equalizer, There is also an SD card slot for loading in media not held on your smartphone, and USB Quick Charge is supported for Android devices. The device has an audio power output of 50W for four speaker channels. There is the option to fit a reversing camera to the Pioneer, which will show its video feed on the unit's display when you select reverse. We recommend you pay for professional installation if fitting a wired parking camera to your vehicle. If your budget doesn't stretch to the $500 required for the Pioneer above, then this example by Sony is a great budget-priced alternative. 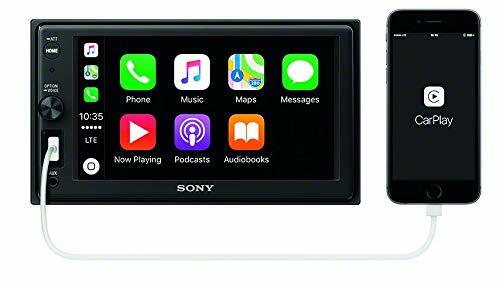 Costing $268, the Sony XAVAX1000 is a double-DIN unit with a 6.2-inch touchscreen and integrated Apple CarPlay and Android Auto. There is also a voice control function and Bluetooth. Although a camera isn't included in the box, this Sony unit can be connected to a third-party reversing camera if you already have one installed, or are looking to buy one in the future. This 6.75-inch flagship from veteran audio company Kenwood includes its own DVD navigation system, plus Apple CarPlay, Android Auto, and Bluetooth. There is also built-in HD radio and Wi-Fi, and the display has an HD resolution of 1280 x 720. Only Android Auto works wirelessly, which is a shame for iPhone users, but wireless CarPlay is still a rarity, even among factory-fitted options on new cars. The unit features inputs for two cameras, so you can have one in the front to help you out of blind junctions, and one in the rear of your car to help with reversing and parking. There are two USB ports, so the driver can use CarPlay or Android Auto from their phone, while the passenger charges theirs. At over $700, this is one of the more expensive options for 2019. 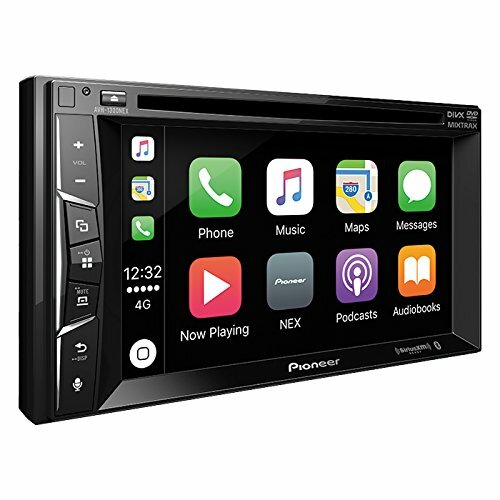 The AVH-1300NEX by Pioneer is one of the more affordable CarPlay head units out there, with a price of $265. You do not get any wireless connectivity for that (other than Bluetooth) and it also misses out on Android Auto. But if you are an iPhone user and want CarPlay in your vehicle, this is a very good option at a competitive price. The unit is double-DIN (as most are) and has a 6.2-inch display. As well as Bluetooth and CarPlay, it comes with Sirius XM support, plus Spotify and Pandora. The screen resolution is fairly low, at 800 x 480, but the CarPlay interface is made up of large icons and easy-to-read text, so that should't be too much of a concern. And anyway, you are supposed to be keeping our eyes on the road. The previous four options have all required a double-DIN space in your car or truck dashboard, but many cars only offer a single-DIN head unit slot. Thankfully, this $550 option from Pioneer features a flip-out display, meaning you get all of the benefits of a large screen (namely, CarPlay and Android Auto) but from a single-DIN unit. The flip-out screen is also larger than most double-DIN options, at seven inches, and the unit also includes a rear-view reversing camera, to attach to your license plate. There's Bluetooth for hands-free calls, but CarPlay and Android Auto and wired-only so you'll need to keep a USB cable in your car.